The measurement of Solids Content of Floor Finishes, Waxes and Polishes from the performance standpoints of durability, consumption, gloss and overall performance has been a point of contention for many years. Non-Volatile Solids Content has been a measurement toll used in top coatings such as floor waxing polishing and cleaning. For the purpose of this article we will be addressing water based floor coatings used on resilient and non-resilient floors. The goal of this discussion is to educate our readers on the truth and eliminate the myth of Higher Solids Content when selecting a floor finish relative to solids content of floor wax. 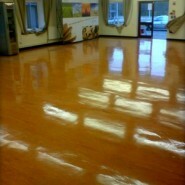 We will also advise what Solids Content is for Floor Wax or Floor Finish. First let us dispel the common myth which is a mistake that many decision makers make when selecting a floor wax… “That the Higher the Solids Content the better the Floor Wax”. The higher the solids content of modern-day floor finishes (waxes) DOES NOT make the floor finish a better performing product. In fact, modern-day floor finishes performance is based on scientific chemical technology through extensive research and development of a particular type of floor finish. So with that stated, we hate to be so straight forward and at the risk of insulting any readers that base their decision on buying a floor finish (wax), if you are basing your decision of buying a floor finish with the thought that Higher Solids Content is a better performing floor finish than lesser solid floor finishes, you most likely are making an error and could be losing the opportunity to purchase a superior performing floor finish for your commercial facility or residential home. See the Fuller Brush Website below for supportive information on this matter. Basically, Non-Volatile content is the amount of product (Film) that is left on the floor after all other ingredients including water has evaporated when the floor finish is dry. Some believe that total solids are what are important to the performance of a floor finish. This is also not true. See the Reckitt Professional website below for additional supportive information on this matter. Non-volatile solids content of the type of raw materials ingredients and how they are formulated in the manufacturing process is what determines the performance of a floor finish including performance characteristics such as durability, detergent resistance, gloss levels, mark resistant, soil resistance, recoat ability, etc. Not all ingredients are the same and vary greatly from one raw material and/or floor finish manufacturer to another. There are many choices in raw material ingredients when developing a floor finish including polymers, resins, waxes, solvents, etc. It is the specific raw materials and their combinations that drive performance and not Solids Content or Total Solids Content. In fact we have discovered and proved that a 16% Non-Volatile Solids floor finish outperforms a 25% floor finish. It all depends on the different polymers available, the manufacturing skill in formulating and combining them, and facilities available to process finish emulsions correctly. In other words, it is the quality of the solids, not the quantity that makes the difference. Hopefully, this information will allow our readers the opportunity to be better informed when purchasing a floor finish product and assist in making the right choice for our readers specific floor care needs.